Article originally published by the 50th Space Wing Public Affairs on December 12, 2017. Five Schriever athletes participated in a “round robin” racquetball tournament at the fitness center Dec. 4-8. The round robin tournament format meant all participants played each other once and the player with the best overall record won. Scott Husted, 50th Mission Support Group, won all of his matches 4-0, claiming the champion title. 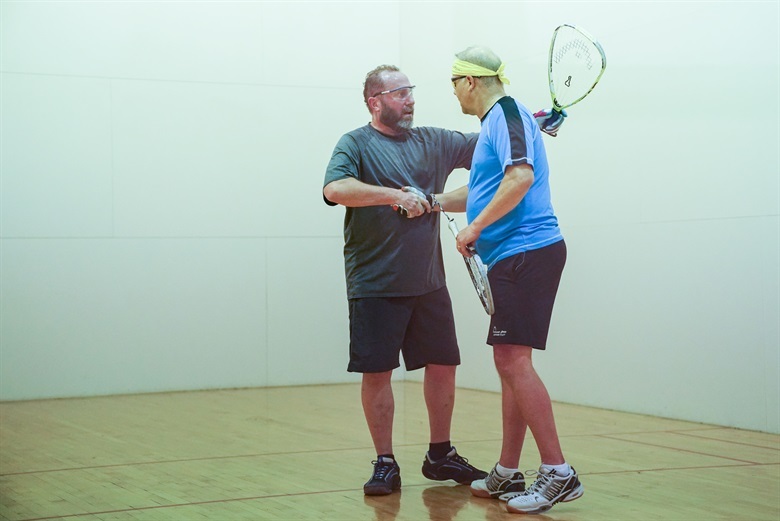 Husted has competed in tournaments since the 1990’s and has been playing racquetball since he was 20. Seth Cannello, 50th Force Support Squadron fitness center director, said the last few years the fitness center has tried to host a racquetball league, but haven’t had enough participant interest. Cannello decided a round robin would be the best way to conduct the tournament, that way, all players would be able to play each other. “Some of the ‘more seasoned’ players didn’t like playing five days in a row because it was difficult on their joints but I think the tournament went well and I know the participants were grateful,” he added. Chad Poulin, Missile Defense Space Center, enjoyed the matches, but said he did not do as well as he would have liked. Both Husted and Poulin enjoyed meeting new players and getting to know Schriever Airmen. “It’s always exciting as you meet new players and friends,” Husted said. Participants were grateful for the fitness center’s accommodations to Airmen’s changing schedules. Husted agreed with Poulin, and appreciated the fitness center’s willingness to work with all participants. For more information about upcoming sporting events, contact the fitness center at 567-6628.